Tomorrow is Lunar (Chinese) New Year and the beginning of the year of the Horse. I'm well prepared for this occasion, with a whole drawerful of horse stamps! Red and gold are lucky colours in Chinese design. I embossed my Deadbeat Designs abstract horse and (awesome!) sentiment in gold on red mirror cardstock. I used an embossing buddy to ensure minimal stray embossing powder. I had to 'buff' the panel to get the extra embossing buddy-stuff off after, but I'm pretty happy with my first try at embossing on mirror card! I made the cardbase out of red mirror card. Beautiful! Thanks for using my stamps! WOW! That is awesome. Thanks for sharing! This beauty jumped right out of my reader and stole my heart! I L.O.V.E. this card! Awesome! Beautiful card and the stamps are gorgeous! I love the sentiment and the card is stunning. The gold embossing on the red is gorgeous. Wow - the 'force' was definitely with you on this cool card! I am so impressed with how well the mirror card stock embosses....did it warp at all? Good call with the silver paper too! I just pinned it (the horsey)! SUPERB in every way! Happy Chinese New Year! So cool! Or maybe hot!! Totally rocks with that beautiful red mirror paper!! Another stunning card and so appropriate for the Chinese New Year! Just gorgeous and perfect for Chinese New Year. Wow, what a shine! I love the brilliance of this! 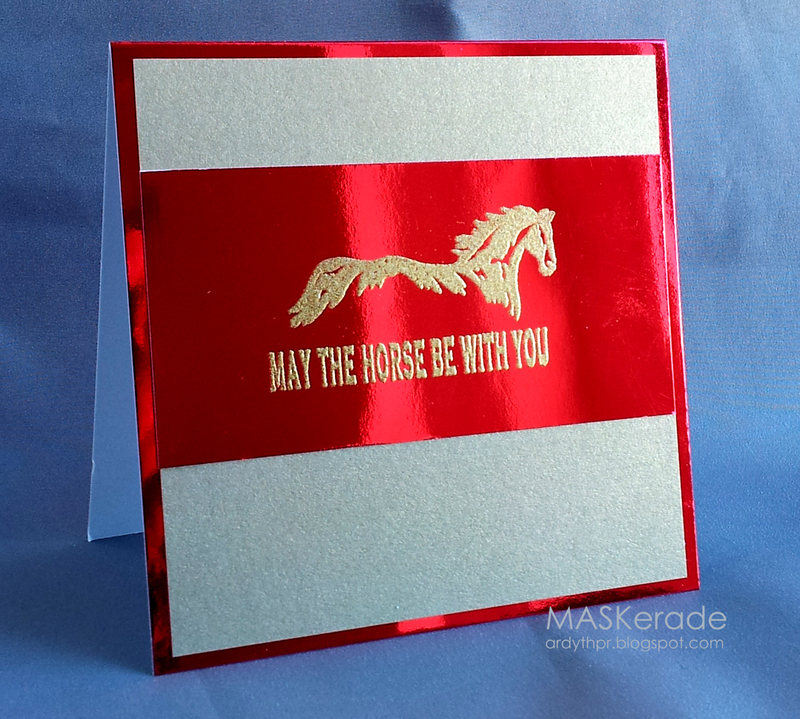 Brilliant sentiment and horse design and it all looks amazing on that mirror paper! Just went over to Deadbeat Designs - they have so much fun stuff! an Awesome card! love that partial horse and wonderful sentiment - how often do you get to use that?!! The mirror red makes it all quite stunning! This is one *hot* card! Amazing! Had to check out that embossed mirror card - cool! I think you can probably emboss just about anything if you are careful to not overheat. Truly awesome sentiment!